If you are an installer of waterproofing decking materials, you are in business to make money and establish a reputation for quality service. Job performance is probably at the top of your list of critical factors a quality job is dependent on. But don’t forget about the quality of the materials that you are working with. Regardless of your skill, experience and techniques, if your materials fail, the project fails. Here are tips from the pros for delivery, storage, and handling of waterproofing products. When items are received, it is important to immediately inspect them for any damage, particularly if any freezing may have occurred. All products should arrive in their original packaging, unopened and with all labeling intact. If any items appear questionable, such as torn packaging, broken seals, possibility of having experienced freezing conditions and thawed, they should not be used. Installers should prepare an appropriate location for receiving materials and storing them throughout the duration of the project. An area that will remain dry, protected from all weather conditions and out of direct sunlight is necessary. Climate conditions of the storage area must be controlled to maintain a temperature between 40-100 degrees Fahrenheit (4-43 degrees Celsius). Jobsite: A project will need electrical power access, clean potable water and a work area that has been cleaned of debris and effectively prepped for application of the waterproofing system. The project’s area will need to be secured from everyone unrelated to the job throughout the application process and until curing is complete. Environmental: Outdoor conditions should be in the temperature range of 50-110 degrees Fahrenheit (10-43 degrees Celsius). Project Area Precautions: All areas surrounding the project area should be protected against the possibility of material spillage or any kind of related damage that could be posed by the application process. Throughout the application process, the materials that are opened and being used need to be protected against inclement weather conditions with a covering like a tarp. Installers must be vigilant against the development of any condensation build-up when using plastic covers. Provide adequate ventilation for the jobsite to prevent any concentrations of harmful fumes. Personal Precautions: Installers need to protect against inhalation of the product’s fumes and any contact with eyes and skin. The use of hygienic breathing masks or more sophisticated respirators are recommended to provide respiratory protection. Goggles or face shields should also be used. Protect skin by wearing long sleeves, pants, gloves and an apron. When taking a break at anytime throughout the duration of the project, always wash hands thoroughly. Beginning a project with quality, undamaged materials. Using materials according to manufacturer guidelines. The second most common cause of project failure is not preparing surfaces properly. Start with a clean surface that is able to effectively bond with the coating. The third most frequently given reason for failure is conditions of moisture. Whether it is a poorly prepared work area, neglect of monitoring condensation build-up in materials, or weather conditions, don’t let moisture ruin successful completion of a job or cause it to fail prematurely. To order supplies for your waterproofing projects, please contact us. Experienced representatives can assist you in selecting the proper materials for specific substrates. 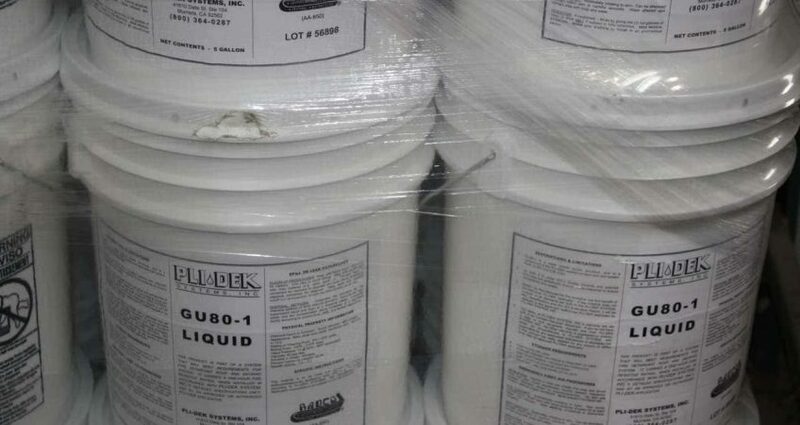 Our team is dedicated to the success of your project and can answer any further questions you may have regarding how to properly receive, store and handle Pli-Dek’s waterproofing materials. Don’t let poorer quality products frustrate your success as an installer. Trust the brand that has been proven effective for more than 35 years.